I have been looking for replacement "non-foglight grills" for my original non-appearance group 1974 2.0 and can't seem to find them in the normal catalogs. Then today I stumbled on to a 2.0 sales ad claiming that his 1974 2.0 was a "rare non-appearance" group car. Is there any proof that a non-appearance group 2.0 was made in any less numbers then the AG optioned cars in 1974? I think I understand from a previous post in this forum that by 1974 you could buy a "package" but you could also al a carte options. But did Porsche keep or publish any numbers on totals built? Also, where can I get these grills to go with a newly chromed bumper and replace my old dingy beat up ones? Don't confuse evil-bay or other seller/buyer/owner enthusiasm for the truly "RARE" cars. Since for most of the 73 MY they were including the AG/PG options in the "914S" trim package to bring buyers over to the 2L /4, there were probably more with the AG/PG than without, since the without ones came along later in the MY when their prices escalated so much vs. the dollar, that they had to offer de-contented 2Ls to be able to continue to advertise the 914-2.0 as available for $5299 thru the end of the 73 MY in summer 73. I think if you take both 73 & 74 914-2.0s without fog lights in however their options shook out, that they'd in total be close to the total of 914-2.0s with them over both MYs, but Porsche never kept records like that, & can barely get the COAs right today, & then usually only with the owner's help! Check with Suncoast or Sunset Porsche to see if they can still get the non-fog "Horn Grills" new (I got some fog type L & R as of a few years ago). If not, try at 914Rubber for nice chromed repros. I did see that 914 Runner had the fog light ones but none like mine. There is a new set on eBay by two different vendors. Going to set you back a bit on the price but may be worth it to you to get what you need. 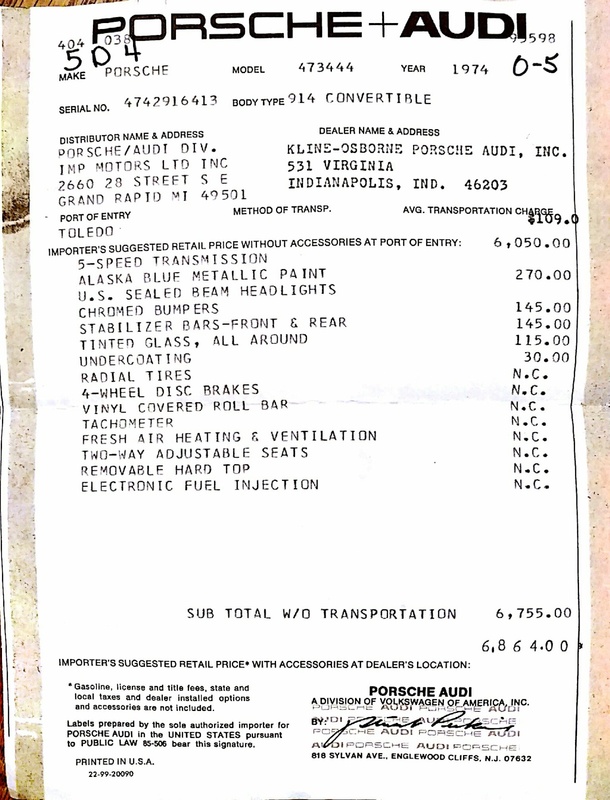 Search Porsche 914 nos. My '74 is a "rare" non- appearance group. Bet it's worth a FORTUNE! I had one of those "a la carte" 74's. Very unusual. bought from original owner with 40K miles in 79'. The black bumpers looked good with the silver finish. You probably know that in 1973, many 914s came fully loaded with what became ala carte 'options' in 1974, so more 1974 cars have fewer options than the 1973 cars. Nonetheless, a 1974 model 914 could have been ordered stripped down with 'standard equipment' in either a 1.8L or 2.0L engine, in 49-state or CA-only variations. and at my 914 Classic site under the link in my signature below.